Madagascar became a French colony in 1896, an Overseas Territory of France in 1946, the Malagasy Republic in 1958, and achieved full independence in 1960. British consuls had served at Tananarivo (now Antananarivo) and Tamateve (now Toamasina) since the 1850s. 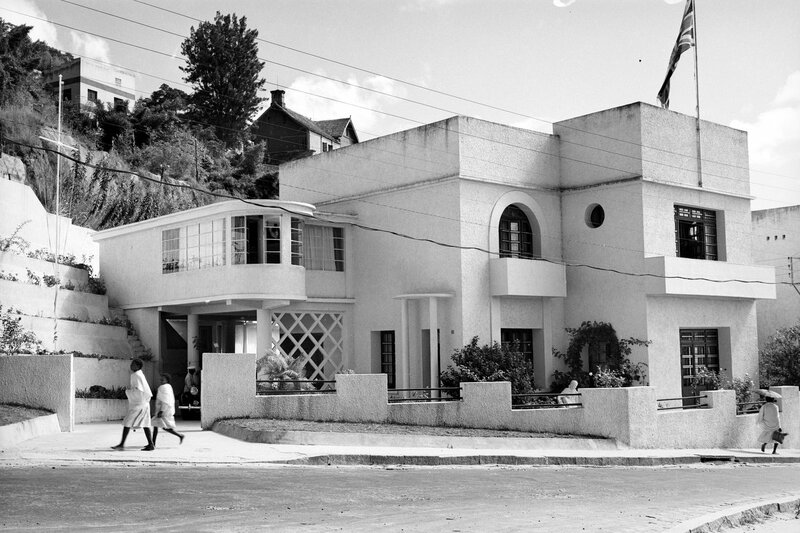 The Villa Shanti at Antsahabe was bought in 1950 as the residence of the consul-general for £25,000, and became the ambassador’s residence in 1960. In 1965, a 0.7 hectare site for a new residence was bought at Ambatoroka for about £15,000, but title registration difficulties made its development uncertain (and the site lay idle in the estate until it was eventually sold in the mid-1980s). Instead, in 1966, Villa Ivandry (also referred to as the Brunot House and Villa Elizabeth), at Lot No 11-J-167 on Analamamitsy Road, was bought for £40,000 and the residence moved into it in 1967. The offices were in leased premises at 41 Rue Choiseul, Parc d’Ambohigatoro. The embassy was closed for most of the 1970s and re-opened in 1979: the residence was sold and the office lease given up during the break. On return, office space was leased in Ny Havana, 67 Hectares, Grandaxe, and the ambassador’s residence was in temporary accommodation until, in 1981, it moved into a leased, newly constructed two-storey detached house, Villa Zakarisoa, in the northern suburb of Ivandry, close to the former residence and about six miles from town. The Post was closed again in [? – and update] . All the parts for a complete consular bungalow, assembled in Britain by Messrs Woodin and Turner for a vice-consulate somewhere on the west coast of Africa, were diverted by the Office of Works to Tamatave, where they arrived in 1886 with many pieces broken or missing. They were re-assembled on a leased site, owned by the Rainandriamampandry family, on the south side of the town the following year. Soon afterwards, the bungalow was devastated by a hurricane but reconstructed by 1890. The leasehold of the site was converted into a freehold in 1899. The consular post ceased to be salaried in 1910 and the buildings were let to a succession of tenants until 1921, when they were sold to the French Mission Society.